I know this sounds totally cheesy, but during the first season of The Hills, Lauren and Heidi went with their respective beaus to The Grove during winter. 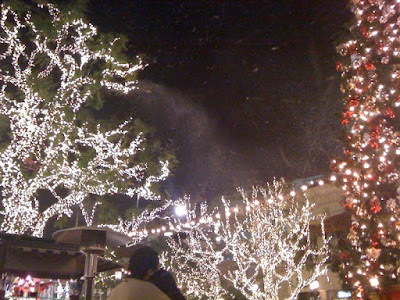 There was fake snow falling all around them and it looked so magical! Since I live down the street from this popular LA shopping center, I figured I'd check out the holiday decorations for myself. I may be 26, but who doesn't love a little Christmas magic? After picking up a few books from Barnes & Noble (Mayflower: A Story of Courage, Community and War as well as The Secret Life of Marilyn Monroe), I headed outside to take in the Christmas tree and fake snow. This year the Chicago Tribune described the tree at the Grove as, "A fir tree from Northern California decorated with more than 10,000 lights and 15,000 ornaments." And even more impressive, NBC explains, "The 100-foot white fir is actually taller than the one at New York City's famed Rockefeller plaza, which was only 72 feet tall last year." 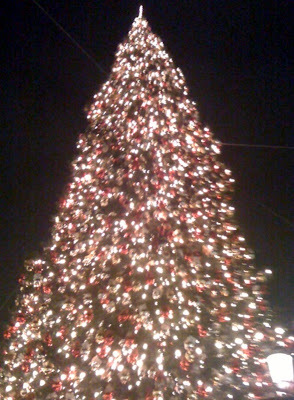 So you can understand why I couldn't get the entire tree to fit in my iphone camera's frame! too cute!! love xmas and all the lights!!! WONDERFUL! As as a ny'er I am NOT offended. I'm posting my tree pics of the Rockefeller tomorrow. One of the pics will really show how big it is compared to 30 Rock... oh boy! love xmas and all the lights!! !